An Ohio officer slammed a handcuffed man’s face into a police cruiser with so much force that it broke the windshield, causing the glass to shatter, newly released footage shows. Despite the violent impact, the local police chief is defending the officer. Dash cam video obtained exclusively by NBC affiliate WKYC shows Pele Smith being escorted to the squad car while handcuffed in Lorain, Ohio. 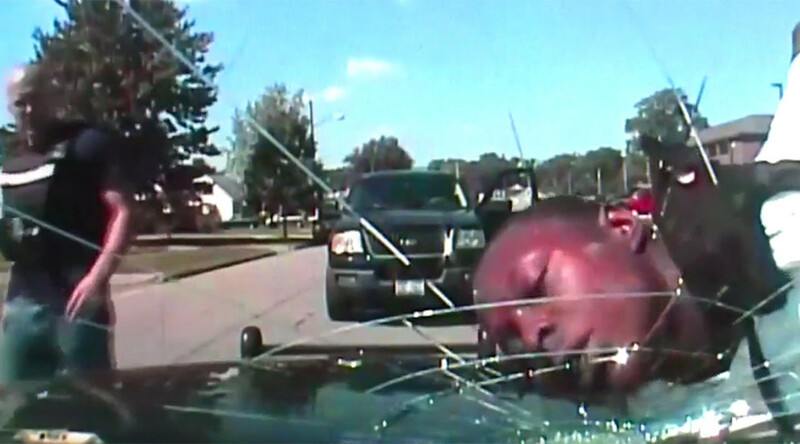 Instead of opening the car door for Smith and placing him in the backseat, the officer escorting him throws him against the windshield so hard that the glass shatters. Smith was treated at Mercy Regional Medical Center for facial injuries following the incident. The arrest took place while police were investigating drug complaints in Smith's neighborhood. According to a statement released by Lorain Police Chief Cel Rivera on Wednesday, Smith tried to destroy drug evidence by placing it in his mouth and “physically resisted officers” as they tried to retrieve the evidence. However, the video merely shows Smith calling out to his mother to look after his son. Smith was ultimately charged with tampering with evidence, obstructing official business, and resisting arrest. As part of a deal with prosecutors, he pleaded guilty and received probation. Last month, Smith filed a civil rights lawsuit against the city and the four officers involved, citing excessive force. The 32-year-old is seeking unspecified damages. The suit specifically mentions Zachary Ferenec, the officer who walked Smith to the cruiser and pushed him into the windshield. It also states that the other three officers did not intervene. The filing also alleges that one officer, Michael Gidich, got into the back of the car and “began to taunt and insult the bleeding [Smith]” while he was being taken to the hospital for treatment. But Rivera defended the officers’ actions, and says the department denies all allegations in the lawsuit. He insists the video can easily be “misunderstood” by the public. “I would caution observers to not rush to judgment relative to the actions of the police officers on scene. Although it is not easy to watch, police officers explain all of their actions in their police reports,” Rivera wrote in the Wednesday statement. Despite the police chief calling Smith a “violent drug trafficker” who was known to police, he has no felony convictions for violent crimes such as assault or robbery, according to the Lorain County Clerk of Courts. He has prior convictions for drug offenses and possessing a firearm.